One major goal of gravitational-wave astronomy is to detect gravitational waves from coalescing massive black hole binaries. The frequency that these binaries form and merge can be extracted from conventional astronomical observations, namely observing “tidal flares”, the electromagnetic flashes following the tidal disruption of stars by massive black holes. Massive black holes, million to billion times more massive than our Sun, have been found ubiquitously in galaxy centers. For example, our own Milky Way Galaxy harbors at its heart a black hole of about 4,000,000 solar masses. As galaxies merge, which is an essential ingredient in the modern galaxy formation model, pairs of massive black holes are expected to form, multiple times probably, over the lifetime of a galaxy. These “massive black hole binaries”, if merge, could emit the loudest gravitational-wave radiations in the sensible range of a space-borne gravitational-wave detector, such as eLISA. Searching for gravitational waves radiated by merging massive black hole binaries sounds exciting and appealing. But one problem, as many theorists have speculated, is that the two black holes, initially kilo-parsecs apart (1 parsec is about 3.26 light years), may never get down to the scale where gravitational-wave radiation becomes important. The bottleneck occurs at a separation of about one parsec, where the two massive black holes quickly eject the surrounding stars because of the “slingshot mechanism”, the same mechanism that the twin Voyager probes were ejected into deep space from the Earth-Sun orbit. Further shrinking of the black hole binary relies on the refilling of the “lost stars”, but in some galaxies, especially those big ones, the refilling process may take very long time, even longer than the age of the universe! With this uncertainty in mind, how can one be sure that most massive black hole binaries do coalesce? Are the gravitational-wave community truly on the safe side when the space-borne gravitational-wave detector finally comes in line? The above problem can be resolved by checking how many massive black holes are solitary and how many live as couples. However, carrying out such observation is extremely challenging, given that the angular span of a massive black hole binary at a cosmological distance, say 1 Giga-parsec, is merely 0.2 milli arc-second. If you could not yet appreciate the challenge, just imagine how to resolve a sewing needle from 100 km away, in a dark night. Moreover, the needle is by no means glowing, as most massive black holes are dormant. Fortunately, there is a slim chance in nature that a dormant massive black hole may be revealed. Theorists from the 1970s have recognized that a star wandering too close to a massive black hole will be torn apart by the severe tidal force. Part of the stellar debris will collide violently with each other and later fall into the black hole, giving birth to an extremely bright electromagnetic flash. The flaring rate estimated for solitary black hole is low – a star needs to aim really precisely toward the black hole in order to be disrupted – about a couple in ten thousand years. Albeit the rarity, the first “tidal flares” were discovered in 2002, thanks to the dedicated ROSAT all-sky survey, and since then dozens more have been discovered by gamma-ray, ultraviolet, optical, and radio telescopes. Around massive black hole binaries, the stellar-disruption rates are expected to be characteristically different. Not only because distant stars can be more easily scattered to the vicinity of the central black hole, but also the stellar distribution on a much larger scale will be modified in the presence of a binary. To quantify such difference, models of the stellar systems around massive black hole binaries have been developed, which often employs sophisticated computer simulations given the degree of complexity and chaos inherent in the system. The results are breathtaking! Unlike the solitary black holes which have featureless, constant stellar-disruption rates, binary black holes first boost the stellar-disruption rate dramatically to a level as high as one per year, then suppress the rate by orders of magnitude, as surrounding stars are quickly depleted. It turns out that the phase with enhanced stellar-disruption rate, although very brief, shorter than 0.01% of the age of a galaxy, contributes a large fraction to the total tidal-flare budget in the universe. The implication is that tidal flares are good indicators of the sites of massive black hole binaries. 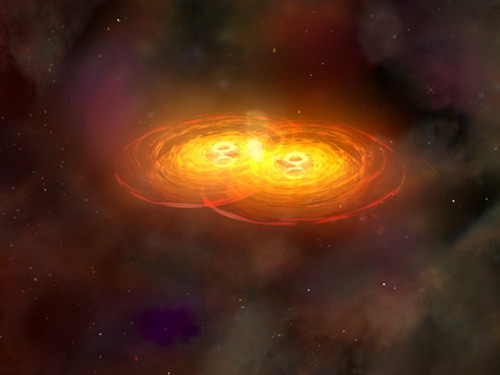 If the massive black hole binary is surrounded by a gas disc, as is expected after two galaxies have merged, this disc might fragment and form stars. The gas disc is separated from the binary by a gap of very low density, which is constantly being carved out by the binaries orbital motion. The torques of the binary may bring the newly formed stellar population on radial orbits towards the center, where they can be tidally disrupted. The tidal flares created in such a system have peculiar observational signatures: The cold disc, which used to be invisible to our telescopes, can suddenly be illuminated by the bright flare at the black hole. This increases the temperature substantially and we might observe it as a peculiar afterglow, providing evidence for massive binaries with sub-parsec separations. Further study also indicates that the enhancement of stellar-disruption rate starts very early, because in the course of galaxy merger, the perturbations on stellar orbits are already strong when massive black holes are kilo-parsecs apart, still isolated in their host galaxies. As a result, many tidal flares will appear offset from the center of the merging system, revealing massive black holes on their long journeys toward coalescence. Ongoing and future synoptic sky surveys, such as Pan-STARRS, eROSITA, and LSST, are designed to catch cosmic flaring events, many of which will be off-centered in their host galaxies. Among these flares, the faction of genuine tidal-disruption events could provide many hints on the merger history of massive black holes, but distinguishing them from “contamination”, such as supernovae or gamma-ray bursts, requires some clever ideas. Coming back to our own Galaxy, we already know there is a massive black hole in the Galactic center, but does it have a companion? Various observations suggest that the companion black hole, if it exists at all, should be very small. Correspondingly, the stellar- disruption rate triggered by the hypothetical binary is not as dramatic as mentioned before. According to recent calculations, the rate is between one in several centuries and one in several millennia, depending on the mass of the companion black hole. For such low rate, we really need good luck to witness a stellar-disruption event during our lifetime. However, it has been pointed out that a past tidal flare may leave traces in the interstellar environment around the Galaxy center. Equipped with powerful modern telescopes, we may find some clues, but we have to look harder!